The British heatwave, and that of many other places, continues. I'm heading to Washington DC on Friday for An Event Apart and looking forward for once to hotel air conditioning! A varied collection of links today as I look slightly outside of layout and to type, new image formats and web components! A lot of the things I add here are based on the things I'm currently interested in, or needing to research for one reason or another. I've currently no sponsors for the email, so if you would like to get your product or service in front of over 9000 CSS-loving folk, take a look and drop me a line. A change that might be of interest for anyone using CSS Grid Layout with row tracks or gaps set in percentages. These have been changed to be more symmetric in the spec, and Firefox has already updated to make them so. If you have used percentages in this way you might like to keep an eye on this coming update in Chrome. I very much feel that it will be the new control we have over type, coupled with our better layout methods in CSS, that will really change the way our websites look. As such, and despite being no typographer, I've been taking a growing interest in typography and typesetting. This book from Tim Brown couldn't come at a better time, and it is available to buy from today. WebP promises us the ability to have beautiful yet performant images on our sites. In this excerpt from The WebP Manual (released today! ), Jeremy Wagner explains how to convert images to the WebP format. "If I find myself doing some contextual layout math, I’ll ask myself if there’s a simpler way. And more often than not, thanks to fr, I’ll find the answer is yes." I spoke at Scotland CSS last week although had to make an unscheduled early getaway due to some sad news at home. My slides can be found here. I'm really sorry I wasn't able to hang around and chat to everyone. We're going to be talking more and more about web components, and this tutorial explains how to create a simple reusable component outside of any frameworks and introduces the Shadow DOM, and how to publish the component to NPM. A nice intro to the subject. A poster layout using CSS Grid and Writing Modes by Sarah Drasner. 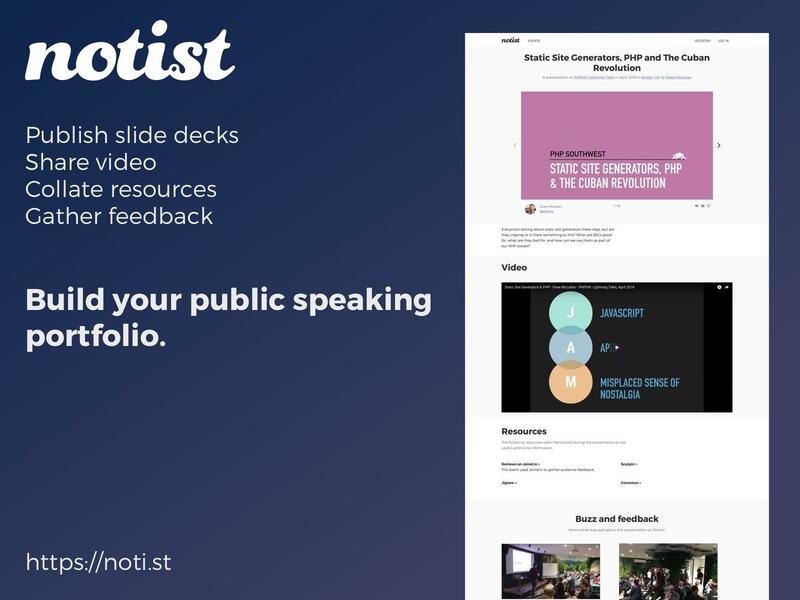 You can share your slides, but also add video, pull in tweets, and build up lists of links and resources for attendees to reference to. Over time you can build up a solid resource of all your speaking engagements.